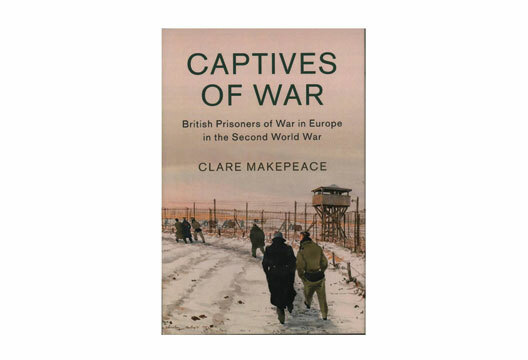 Captives of War: British Prisoners of War in Europe in the Second World War by Clare Makepeace (Cambridge University Press; Hb £31.99) Reviewed by Jamie Hacker Hughes. Captives of War documents the journey and experience of British prisoners of war in Europe during the Second World War (although the First World War is also mentioned briefly). The experience of British POWs in the Far East, yet another very harrowing story, is not covered here. The book takes us through the phases of capture, imprisonment, liberation and resettlement and is based on nearly 100 war diaries and sets of letters held as archive material by the National Archives, the Imperial War Museum together with other sources. From a psychological point of view, the most illuminating chapters are those that describe how prisoners developed a ‘Kriegie’ (from the German Krieg: war) spirit and mentality as a means of survival and developing a very different sort of personality to that exhibited before imprisonment. Another chapter, ‘Going Round the Bend’, describes vividly how many suffered marked psychological disturbance, often severe psychological disturbance, as a result of that imprisonment. But the psychological effects of imprisonment did not end with liberation. The vast operation that was mounted to assess and assist liberated service personnel gives some indication of the scale of the problem. The book is illustrated with diary extracts and by original drawings and cartoons backed up by numerous military reports, many from the Department of Army Psychiatry. Psychologists do feature here but are outnumbered by military psychiatrists, because at the time of the war psychologists were, in the main, involved in research and selection and, of course, the development of the discipline of clinical psychology was yet to begin. chapter by chapter, at the end of the book to provide a more accessible experience for the reader. The only other thing that really begin to grate in this otherwise generally excellent book was the author’s habit of repeatedly citing, quoting or otherwise referring to the title of book throughout. ‘This book’ would have been quite adequate. All in all, though, an extremely interesting read, which I would recommend to all psychologists and others interested in the psychology of war, warfare and survival psychology. - Reviewed by Professor Jamie Hacker Hughes, who is, among many other things, Visiting Professor of Military Psychology at Anglia Ruskin University. See also the 'Looking back' piece in this issue.